This is the third part and the conclusion to the Mathematics and Multimedia’s Calculus Primer Series. The first part can be read here and the second part can be read here. In the previous part of this series, we have discussed how mathematicians of the ancient times found clever ways to find the area of regions bounded by curves. We used this knowledge to generalize a way to solve the distance traveled by an accelerating car. In this post, we continue with the discussion of the second problem: How do we find the acceleration of the car at a particular instance? 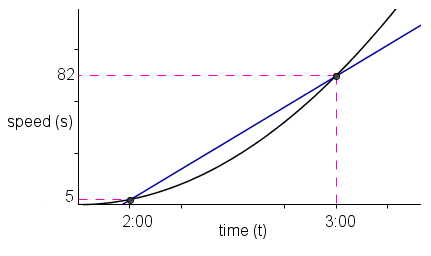 In the first post in this series, we discussed about the graph of the speed over time of two cars, A and B. Car A was traveling at a constant speed from 2 to 3 o’clock, while Car B was traveling the same time but accelerating. As I have stated in the introduction to Solving Motion Problems, a moving object discussed in elementary and middle schools are usually assumed to be at a constant speed. For example, a car traveling at 65 kilometers per hour is assumed to travel at the said speed the whole time. Of course, this is not what happens in reality. The car speeds up, slows down, or stops at times.